Permission has changed for 6 of 13 apps with updates available. 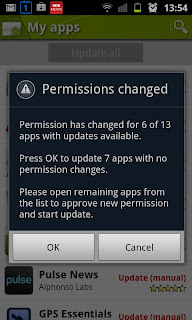 Press OK to update 7 apps with no permissions changes. Please open remaining apps from the list to approve new permission and start update. This app shows you what’s changed! On starting "Update My Apps", you'll see a list of all installed apps. Clicking one will show you how its permissions will change when you update it (coloured red for "added", green "removed" & grey "unchanged"). 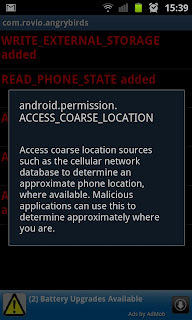 Clicking a permission will show you the official Android explanation. For more help, please see the FAQ or ask in the forum. ...to make spotting things easier. ...to make assessing easier and less technical. ...so you can quickly understand what you're getting. Easier package list navigation (indexed list). Button to activate a permission blocker app (if one installed). Although this app started as a way to show how permissions had changed, our first non-geek users begged us to change! We're now busy switching it to being a more general-purpose "Update My Apps" app since they said it would be more useful.